Dyed Canvas offered comprise quality canvas fabric that is dyed through technically advanced dyeing process so as to provide in them consistent and flawless finish support. Made available at competitive prices, these dyed canvas fabrics can be made available in options including cotton rib-stop canvas, polyester cotton rib-stop canvas and others. 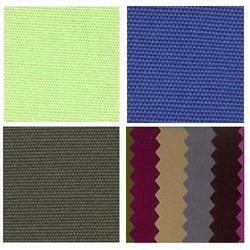 Our Organization offer a wide range of Dyed Canvas. Our fabric treatments protect canvas from Rotting, Ultra Violet, Weather Extremes, Tropical Rains and Molds. The fabrics can also be given Flame Resistant Treatments, Oil Resistant Treatments, Wrinkle Resistant Treatments,and Disruptive Prints etc. We can dye Reactive, Vat, disperse, Sulphur, Acid dyes.